Ben straps on some pads, polishes his balls, and checks out the latest in that rare breed: the cricket video game. Pity the video gaming cricket fan. Cricket's a much better sport than most of the ones the US gets (often inexplicably) excited about, but because Americans aren't big on it, no major publisher wants to spend the dump truck full of money that the Madden or NBA franchises command per entry on producing a high-production-values digital version of it. This generally leaves gamers that fancy testing themselves against a fired-up Dayle Steyn with only a couple of options: 1) scrape amidst smaller, lower-budget efforts, with occasionally notorious results; or 2) winning selection in their nation's international cricket team. My cricket game highlight for many years was 1993's Graham Gooch Cricket – a game that destroyed three Amiga 500 joysticks in our house, and contained an exploit that made it possible to bowl the computer out for a team total of zero. It has, in other words, been lean times. 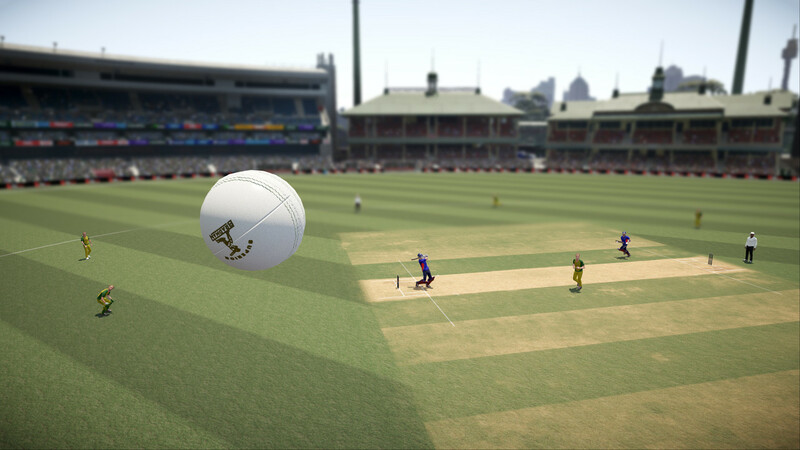 So thank goodness for Australia's Big Ant Studios, who popped up a little while back with Don Bradman Cricket 14, the most polished and well executed cricket game yet made. They're back again this year with (surprise!) 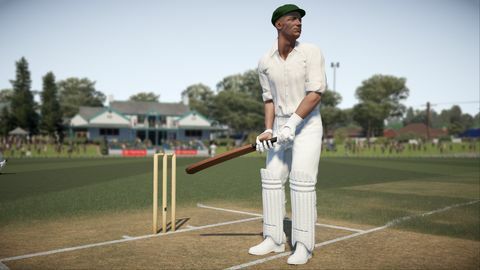 Don Bradman Cricket 17, and while they may not have EA money to throw around, it's still an accomplished title, with enough neat little additions to keep them at the top of the (small) cricket game heap. Don Bradman 17 takes several steps to improve upon its predecessor, mostly found within the game's options. There are tweaks to the batting and bowling control systems, which remain intuitive enough yet demand almost fighting-game-style muscle-memorisation for true success. Batsmen can now deliberately knock the ball into gaps around the field for singles with the appropriate button press, while bowlers can finesse their delivery length over the four basic options - short, good, full, and yorker length - by bowling (for example) a shorter full length ball or a fuller full length ball. This adds subtlety and complexity, but more button options, too, and the game's early hours are spent simply trying to remember how play shots or bowl deliveries. Fortunately, step-by-step tutorials are on hand to walk you through both batting and bowling controls. These are near-musts for any new player. Optional onscreen prompts let you know how you performed, and you can head off to the calming environment of the nets or an open wicket practice to further hone your skills. Fielding's undergone many improvements, too, with players sliding around, tapping balls back from the boundary, and shying at the stumps. The game's default "semi-manual" control wisely takes care of sending fielders after the ball, leaving the player with more crucial tasks like taking tricky catches (via a slow motion, icon-positioning mini game), hitting the stumps, and diving on the boundary. 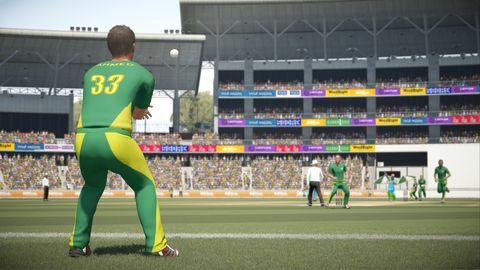 While no cricket game yet has managed to make fielders move and behave like actual human beings, it's a notable improvement, and makes fielding actually engaging for the non-bowling player in co-op. Fielding animations are part of an improved graphical package overall. 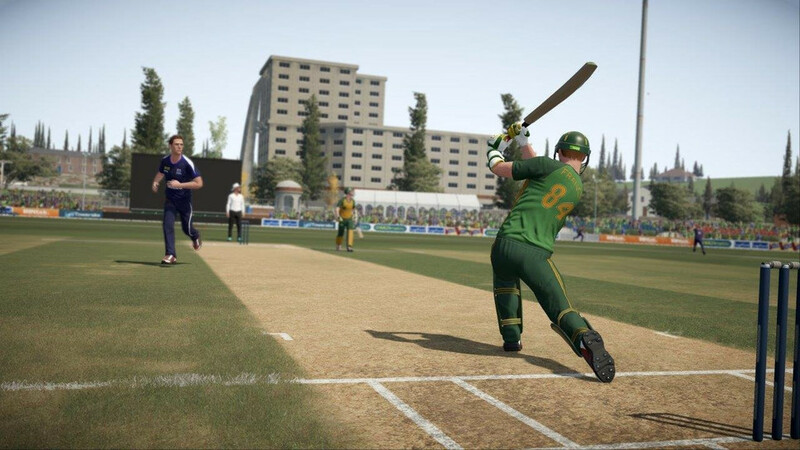 It doesn't always quite scan visually, but in general the motion-captured player animations hold up, and the cricket looks mostly cricket-esque. Successfully playing an aggressive, grounded shot in order to caress one through the covers, for example, is the same satisfying treat as in the real sport. 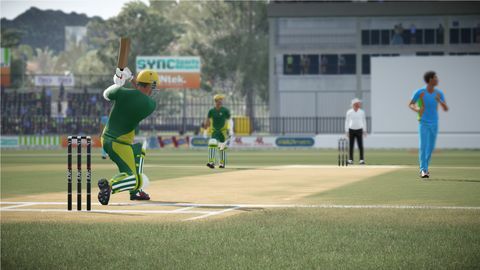 The 2017 edition's most marked visual improvement, though, is in the stadiums, which have broken away from the 2D look of Don Bradman Cricket 14 into more fully realised environments. The game also includes a stadium creator, so you can build facsimiles of the Cake Tin – or the park down the road from your place. 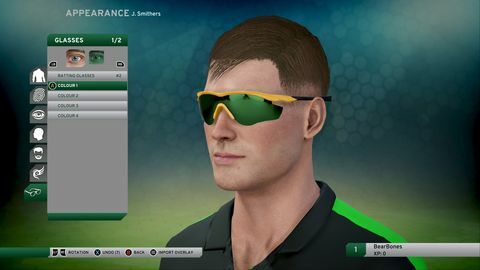 The stadium creator is just one of a huge array of customisation options: everything from bat labels and advertising hoardings to player stats, physique, sunglasses and tattoos. 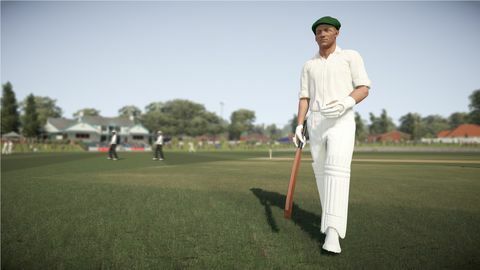 Don Bradman Cricket '17 has no official licences on board (except Bradman's estate), so players are prompted to download player-created national and international teams from its online database, which gets placeholders like "Guillermo Ethan" and "Laith Rudolph" out of the New Zealand side and Grant Elliott and Luke Ronchi into it. The system largely does the job, with the odd quirk: I wondered what was going on with the player named "Q. de CENSORED" in the "best" South African team before realising he was Quinton de Kock. 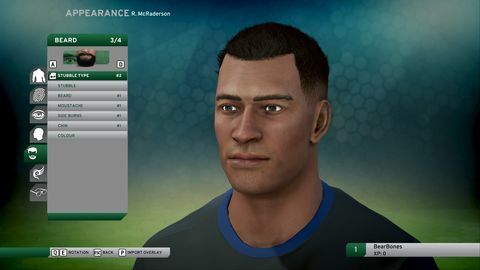 The same can be done with stadiums, historical teams and individual players as well, so if you think it's a travesty that Craig McMillan has made the default all-time NZ team over Martin Crowe, you can download the most popular version of Martin Crowe available online, browse all players by that name, or simply put your own Hogan together with the player creator. It's a deep well of options - commentator Mike Howard must have spent hours in a voice booth recording a truly prodigious number of surnames - but the sheer volume makes it all overwhelming and messy. It seems easy to accidentally download multiple versions of things, and if you can't work out where that "best" version of Hagley Oval you downloaded got to, it might be because whoever made it has listed it as a ground in South Africa. Nevertheless, true cricket tragics could lose themselves for hours. 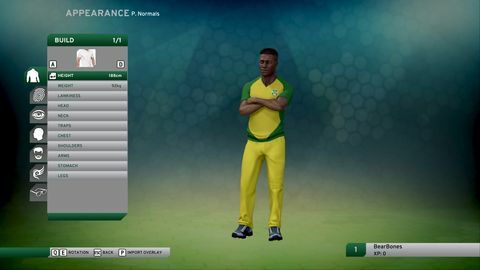 Cricket nerds will likely put in the hardest yards in the game's improved career mode – again, filled with options. You can start as an established star, or as a lowly club cricketer working their way up. The game provides the option of entering simulation mode at any point, so there's no equivalent of sitting with your pads on for hours, waiting to bat - just skip over the bits that don't involve your star. It's also cool to see female players included in a cricket game for the first (!) time, as the sport in general looks to place a renewed emphasis on the women's game. 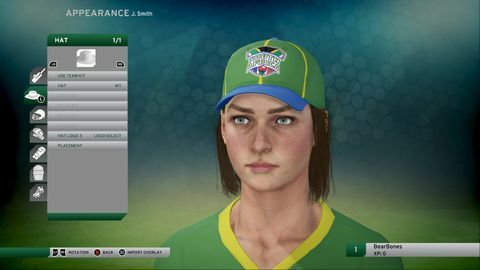 Big Ant have taken the time to do this properly as well, creating separate character models and ensuring those differences between the men's and women's game (such as in bowling speeds and power hitting) are reflected. It's a noticeable change in gameplay, and provides the opportunity to relive the recent heroics of Amy Satterthwaite as well as Kane Williamson. Elsewhere, couch co-op and versus are readily available (hurray!) and provide plenty of amusing opportunities for accidentally running your friend out and in-lounge sledging. You can head online to test yourselves against ranked players, play a one-over game, an entire IPL, or beat the prevaricating ICC to the punch by designing your own World Test Championship. In every game setup, you can adjust options like time of day, weather, pitch wear rates, and even the pattern in which the groundsman mows the outfield. It can be difficult to discern how some of these options affect the actual gameplay, but presumably they're all ticking away under the hood. There are a few issues. Commentary, delivered by Aussie cricket journo Howard and fringe England player James Taylor, is banal and a bit broken. This is another issue cricket games have always had, with stock phrases often hilariously incapable of coping with the complexities of the on-field action, or so generic as to be meaningless. "Now entering the attack is the right-arm fast bowler" is not something you will ever hear from Ian Smith. And while Don Bradman Cricket is one of the few games to have made bowling even remotely interesting, sometimes you'll yearn to control delivery line, as well as length, which isn't an option. But these are minor annoyances. Cricket is a difficult sport to adapt to games, and it's good just to have an excellent sport finally done proper justice. Bowl on in, cricket fans. Ups Huge range of customisation options. Gameplay systems successfully replicate many of the subtleties and complexities of the sport. Hugely improved fielding and stadium options. Good tutorials and practice systems. Downs Content downloads and options menus can be a bit of an organisational mess. Voice commentary generic and only semi-accurate.